The Design for Movement team has worked with Regent’s University London since November 2015 to develop a site wide wayfinding system. The key objective of the work is to deliver a comprehensive wayfinding system that will improve the visitor and student experience while projecting the University's unique character. Current deliverables include the design of a user focused campus map for print an online use. The print map works as a tear-off, A4 double sided sheet including a location context map on the reverse highlighting strategic transport connections. In addition to the campus wide map we have also developed internal building plans in order to identity how best to communicate information and the connections to buildings. 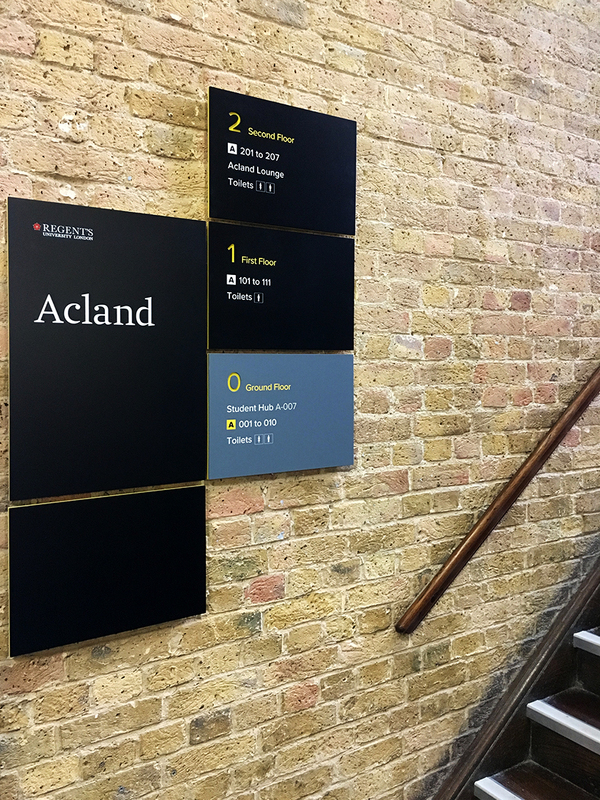 The next stage of the project will be to design and deliver a pilot concept signage system for Acland Building in order to test the system prior to a wider campus roll out.